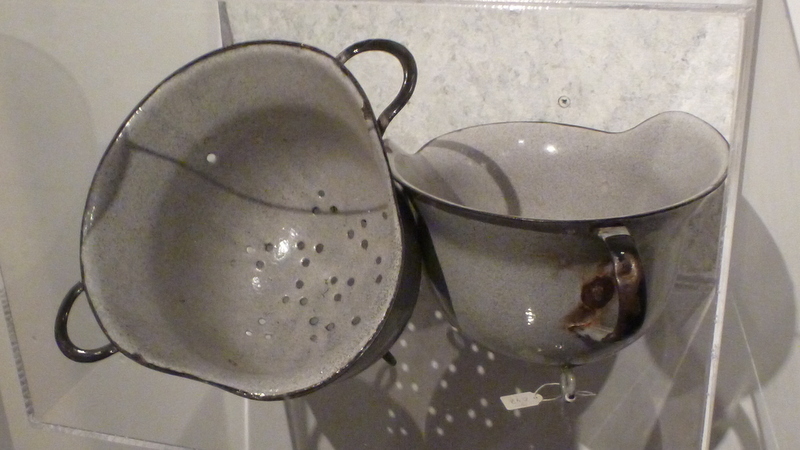 Strainer and chamber pot fashioned from German helmets after the end of the Second World War. Resistance Museum, Amsterdam, September 8, 2013. My wife and I just returned from Germany, the Netherlands, and Belgium, where we spent ten days celebrating our thirty-fifth wedding anniversary. Among the many interesting places we visited was a museum devoted to the Dutch resistance during the Second World War. (See photo above.) For reasons having to do with my desire to remain married for another thirty-five years, I didn’t play even one hole of golf. 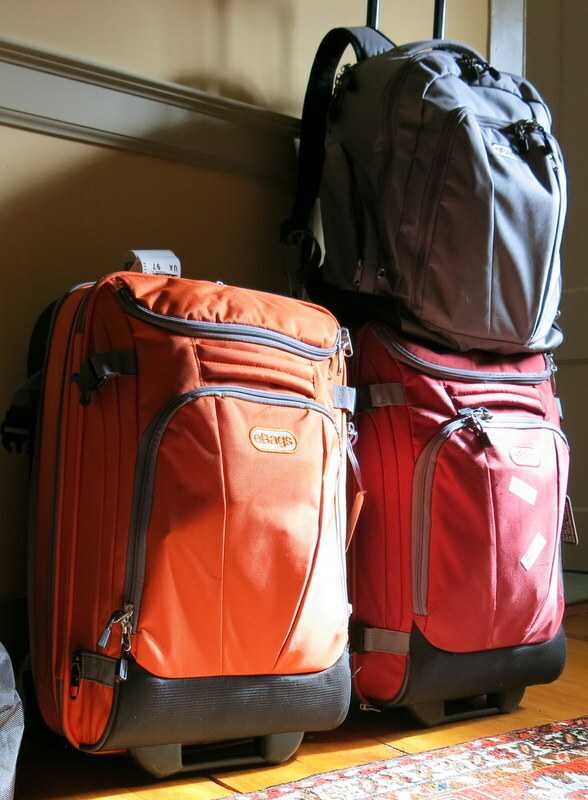 But I did do some golf-related luggage research, and I wife-tested a few ideas about minimalist packing. We each took just a carry-on bag and a small backpack (plus my wife’s purse). All the luggage was from eBags, an online luggage company for which I am an unpaid shill. Here’s what we took: two eBags Mother Lode TLS Mini 21″ Wheeled Duffels; an eBags TLS Workstation Laptop Backpack; and a similar, older backpack, which eBags apparently no longer makes but is a lot like this one. My wife not only got along fine without a big suitcase but actually packed lighter than I did. We didn’t carry the carry-ons onto our plane—international flight, one checked bag free—but once we were in Europe our relatively light load made it easy to get on and off trains, climb stairs, take the tram instead of a taxi, etc., while still leaving room for souvenirs. The bags are perfectly designed, and the laptop backpack is like a mobile office—not that I did any work. 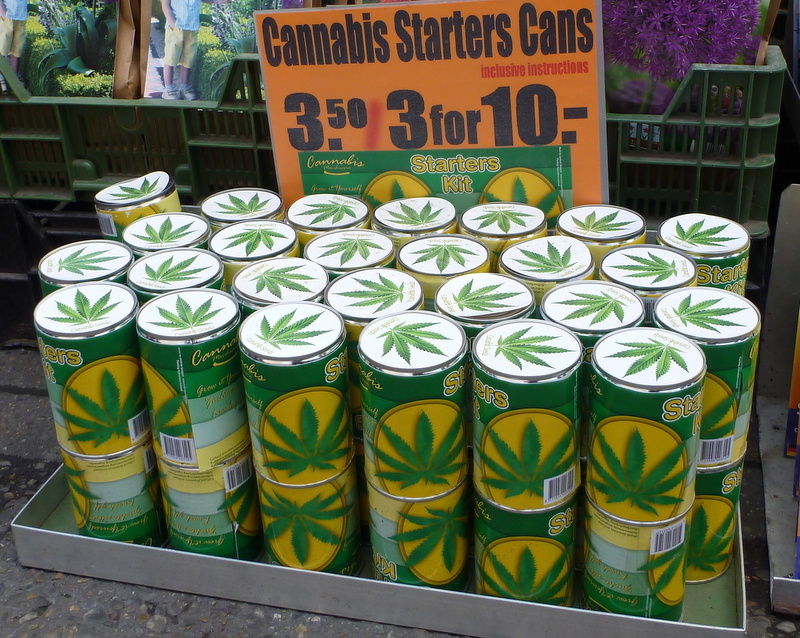 Souvenirs, outdoor flower market, Amsterdam. Although I left my golf clubs at home, I did take two pairs of golf shoes, both by True Linkswear, another company for which I am an unpaid shill. They were the only shoes I took on the trip, and (it turns out) I could have gotten by with just the black ones, a model called Chukka. (I took the others, called Sensei, because the Chukkas look a little spooky when worn with shorts—but then I ended up never wearing shorts.) Chukkas are waterproof; Senseis are not. 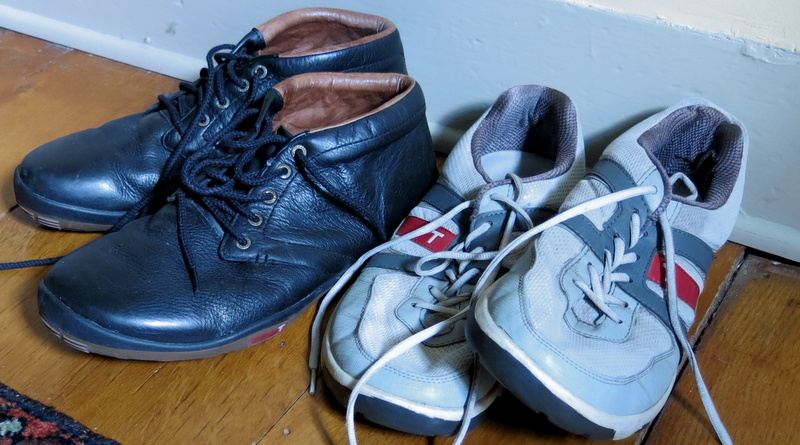 Both are extremely comfortable, and, by comparison with some of the shoes that Europeans wear, Chukkas don’t look strange at all. True Chukka (left) and Sensei (right). Before we left for Europe, I held tryouts for the position of Trip Pants. The pre-competition favorite was a pair of black Nike flat-front Dri-Fit Tech Golf Pants, which are 95 percent polyester and 5 percent spandex. But when I wore them for a test round on my home course I decided that they made too much noise when I walked, and that they felt too much as though they were made of bubble wrap. I had similar issues with a super-cheap pair of no-name pants I found on Amazon. The eventual winner was a pair of black Dockers Advantage 365 Khakis, which are 100 percent polyester microfiber. 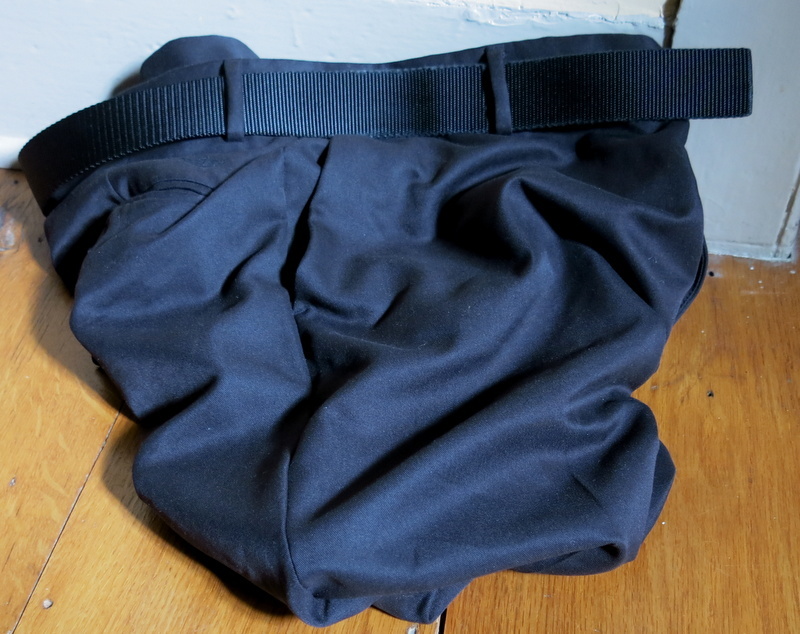 They don’t wrinkle, they don’t stain, they can be “laundered” in a hotel-room sink, and they look fine in the morning if you leave them in a heap on the floor overnight—yet they remain silent when you cross your legs. I also took a pair of pre-wrinkled 100 percent cotton Dockers in a grayish color, which, unlike the Advantage 365s, don’t look like the bottom half of a limo driver’s uniform. But if I’d been on a golf trip with my pals, instead of a romantic getaway with my wife, I’d have taken a second pair of microfiber instead. This entry was posted in Accessories, Buddies Trips and tagged eBags, True Linkswear by David Owen. Bookmark the permalink. Sounds like you’re getting this travel thng down. From the photos looks like you’ll be doing your own greenskeeping back home. Congrats on the anniversary!